Curved glass has become extremely popular with designers, architects and consumers to form distinctive, high impact and charismatic building facades, canopies and roofs to make their building unique and a conversation topic. Acorn Glass are able to provide you with curved glass of simple or complex shape and conical, convex or parabolic curved shapes that can, if required, be subjected to additional treatments with safety glass resulting in an insulated glass. 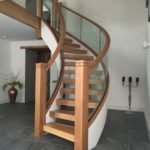 Curved glass is being used, by Acorn Glass, in a wide variety of installation areas that include balustrades, shopfronts, office partitions, reception screens, stairs and elevators, domestic properties, shower screens and lifts. Kemys Folley, a Grand Designs project, was carried out to strict timescales and budgets and , due its exposed rural location, carefully considered structural calculations needed to be carried out by our in house technical team who are available to assist you in any similar project you may have. 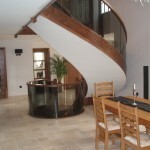 At Acorn Glass we can provide you with curved glass to most radius and our curved glass comes in either annealed which is non impact resistant, laminated, toughened, toughened/laminated and double glazed, to suit your requirements. This glass can also be be tinted, patterned or textured to provide you with the result you are looking for. Laminated and toughened will be particularly reassuring to all when installed in public places or busy environments where the risk of injury will be substantially reduced. If you have any complex glass bending requirements our technical team are available to offer assistance and advice. 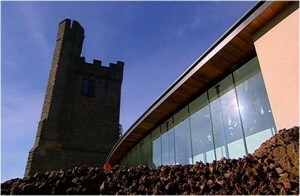 Grand Designs: Acorn Glass were the glazing contractor in the design, manufacture and installation of curved glass walling and full height glass wall panels on the Grand Designs project at Kemey Folley in Gwent. Restrictions on size and shape apply to curved glass. The level of these restrictions depend on various factors such as the thickness of glass to be curved, the radius , and whether the curved glass will be cylindrical or non-cylindrical.